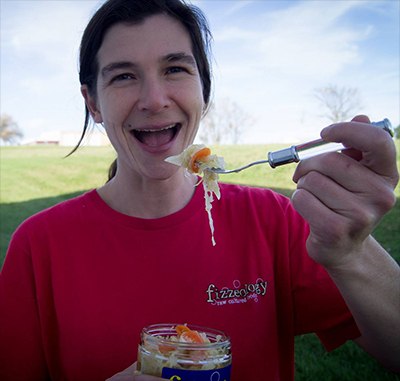 Fizzeology is family-owned & operated and works out of the The Food Enterprise Center in Viroqua, Wisconsin. They produce certified organic, fermented vegetables. The company is committed to strengthening local community by sourcing ingredients from small, local, organic farms. Their mission is to raise health awareness, one gut at a time, marketing real food products in harmony with nature. The team at Fizzeology passionately ferments delicious organic foods that supply energy to the body and aid natural detoxification. Educating the public on the benefits of eating raw, fermented, local and organic foods is a high priority to them, and we're proud to help them promote their quality products! Look for the line of Fizzeology products in our dairy cooler!